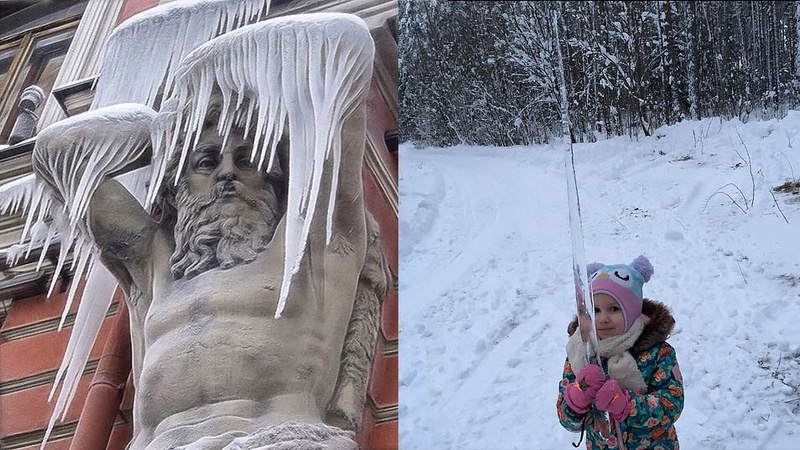 As the weather in European Russia fluctuates around the zero mark, snow accumulated over the past few weeks has melted (before freezing again), lining city roofs with menacing icicles. Since Wednesday, at least three people, including a 9-year-old boy, were hospitalized with injuries from falling icicles in the city of St. Petersburg alone, local media reported. Other icicles have been more benevolent and photo-friendly. Here are some of the most spectacular, terrifying and beautiful ice formations this season. No building is safe from all these pointy icicles lined up in a row. #IcicleChallenge: Find an icicle longer than you are tall. The camera loves you, baby. These pointed icicles of death are not at all terrifying. This intrepid soul decided to take matter in his own hands — without any support or protection. “This is why women live longer,” a social media user commented. Have you ever seen a frozen waterfall? No photographers were hurt in the making of this photo. If they don’t film a horror movie here, they’re doing it wrong. That feeling when you aren’t even sure what you’re looking at, or where you should be looking.